At New Year's, D and I decided to start a season of fasting as a way to find new ways of living and to break out of some of our old patterns. Our first fast was a financial one and while it didn't go entirely as planned, we did learn something about our spending patterns that will hopefully help us make better decisions in the future. 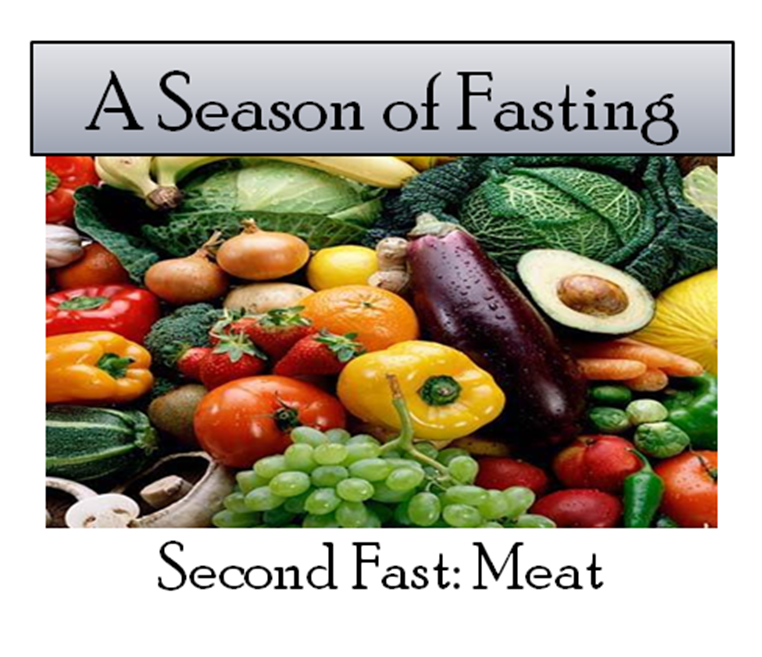 Our second fast is a fast from meat. This one is prompted in part by the fact that there isn't a lot of variety in the types of meat we can buy here and what we can get isn't always the best quality. D and I also love to cook and we were excited by the idea of trying to come up with vegetarian recipes that we could make with our limited produce supply (this post will give you an idea of what it's like to grocery shop on Kwaj). Sky and Fire have gotten to be pretty good eaters and I was surprised to realize that neither of them had noticed the lack of meat in our meals this weeks. There were some recipes that they really didn't like (the vegetable jambalaya, in part because of it's brown color, was compared-unfavorably- to poop) but we also had some that everyone loved- unsurprisingly, they're the ones that were fried, cheesy, or familiar. D and I are going to try and do better next week but the big take-away from our first week as vegetarians was that, at least for our family, being vegetarian did not necessarily mean eating healthier. I sauteed mushrooms, garlic, leeks, and red pepper in butter, then added flour and milk to make just enough white sauce to bind the filling together. Since cheese makes everything better, I added about a half of a cup of Parmesan cheese. The ravioli were made from wonton wrappers which worked out perfectly since they're already cut to the same size and fry easily. 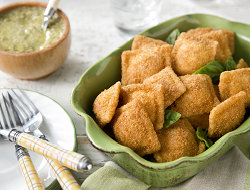 I served the fried ravioli with a pesto dipping sauce (no special recipe here- our basil died so I used a McCormick's packet), which also went on top of the Bulgar wheat I served with them. The kids loved these and we're probably going to have them again. Need I say more? 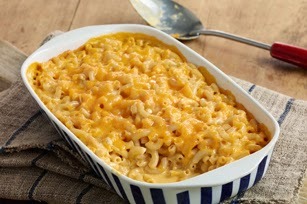 If your kids love cheese and noodles, larger servings of this, with baby carrots on the side, can make a meal. Mix these four ingredients together in a small bowl and then add enough water to make a batter (I think I added about a cup). 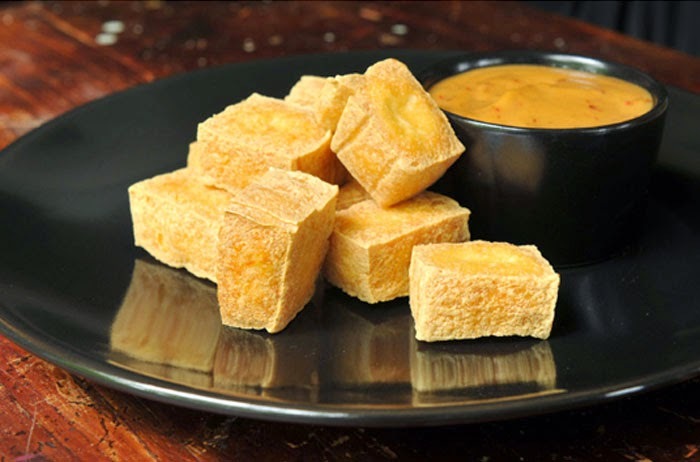 Once the tofu was drained, I cut it into 1-inch cubes, rolled it through the batter and deep-fried them. 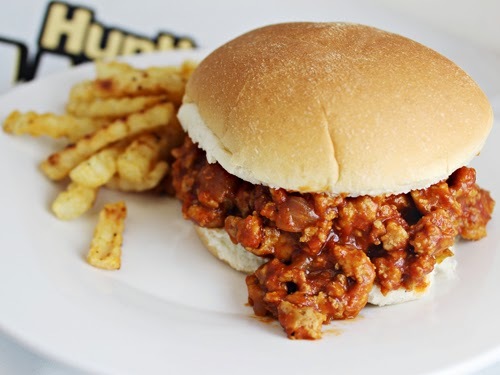 My kids have had this before and like it- it's sloppy Joe's made with TVP instead of ground beef. I usually serve theirs in bowls topped with cheese. These, with French fries and homemade coleslaw, made for an easy dinner on a particularly busy day. Oh my! Those recipes look really good! I was a vegetarian for 14 years and although now I eat near I can't have a meal without tons of veggies. My favorite part of being a vegetarian is that you learn how to make veggies taste so good. Can't wait to read what else you'll make!